Getting quickly and easily back to the starting point is always a challenge for multi-day Erie Canalway Trail cyclists. Erie Canal Bike Transport is working hard to remedy that. 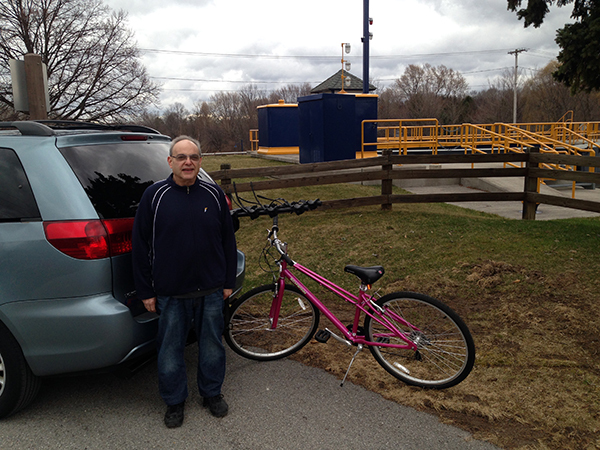 Meet Evan Schiller, owner of Erie Canal Bike Transport. Ten years ago, Schiller was ferrying travelers from the airport to a popular Rochester-based bed and breakfast when the owners of the B&B asked him if he would like to expand his service to provide cyclist transport. As the B&B had recently been included in the Three Day Itinerary-Lockport to Palmyra, the B&B owners had received a number of requests from their guests to be driven back to their starting point. “I really didn’t have any experience doing this, but I recognized the need, bought a trunk bike rack and gave it a shot,” said Schiller. As requests continued for transport between Lockport and Palmyra, his business grew to a four-bike rack system. This year, Schiller has equipped his vehicle with a five-bike rack and added a second van to his fleet, allowing him to handle groups of up to eight. In 2015, Schiller also plans to cover the entire length of the trail from east to west. In keeping with the theme of the classic Erie Canal song, Schiller has named his mechanical “mule” Sal. “The Erie Canalway Trail is such a great resource,” notes Schiller.” The people that bike the trail think it is fabulous.” Schiller hopes the 2015 release of the new edition of the Cycling the Erie Canal guidebook and Cycle the Erie Canal website will be a great opportunity for bicyclists to learn of his service and that it can make their experience easier to manage and more enjoyable. He credits the Bicyclists Bring Business roundtable, held in Tonawanda in October, with his decision to add a new division and website to his transportation company and name that part of his business Erie Canal Bike Transport to help more cyclists find his service. According to Schiller, all his cycling customers have been out-of-state residents or visitors from abroad, the majority of whom visit the trail in June and July. “These cyclists are very organized and book their transport months in advance. They are professional and prepared; rarely do they wing it. My goal is to meet and hopefully exceed their expectations,” said Schiller. “It’s been a very pleasurable experience. You meet great people. Everyone says they’ve found my service to be very desirable and convenient. It gives them peace of mind that they can return to their starting point without any surprises,” added Schiller.